There are cake decorating supplies that you can use when cake decorating at home to make the task much easier. 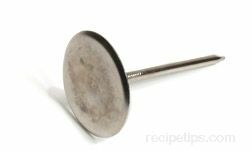 You will be surprised at how much easier it is to frost a cake when you are using the right spatula or how a turntable makes frosting all sides much simpler. For basic cake decorating at home, most generally you will not go out and purchase most of these tools unless you are going to be cake decorating on a regular basis or plan on going into the cake decorating business. But if you like cake decorating you may start to collect some of these tools to make your efforts more enjoyable. Also, having the right cake pans is an essential part of cake decorating. 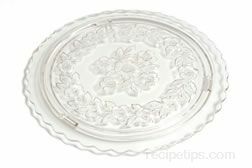 You will need the right size and shape for the design you are creating and some cake decorating ideas may require a cake mold to create the shape desired. There are an endless amount of tools for decorating cakes. Shown below are some basic tools that help make cake decorating a little easier and create better end results. 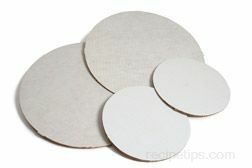 A cake plate or cake board can be used to hold the cake. 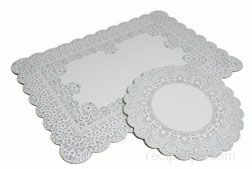 Cake plates can be very plain in design to very decorative. They can be made up of various materials, such as heavy cardboard, plastic, wood, or glass. The type of plate you choose to use will depend on what you have available and what you feel is appropriate for the type of cake you are making. Cake boards can also be made if you do not have one available to use. They should be made of a sturdy material such as heavy cardboard, plywood, or particle board. A synthetic cutting board would also make a good sturdy cake board. The board can be covered with foil, wrapping paper, or cloth to give it a finished appearance but it should then be covered with plastic wrap to protect these surfaces from coming in direct contact with the cake and frosting. cardboard or they can be purchased where cake decorating supplies are available. 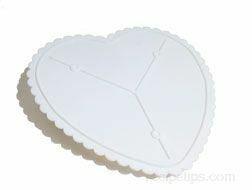 The cake disks are generally the same size as the cake and make it easier to frost and decorate the cake because they allow you to hold the cake in your hand. They also allow the cake to be moved without the use of a plate. 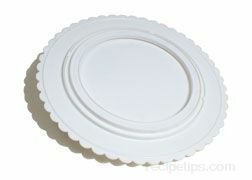 Shown above is the bottom of a cake plate with a lazy susan. The turntable is a plate, generally about 12 inches in diameter, that is mounted on a pedestal on which it can rotate or as shown here with the lazy susan on the bottom of the plate. This tool makes it easy to turn the cake as it is being decorated, providing easy access to all sides of the cake when the frosting is applied. If you do not have a turntable designed specifically for cake, a regular plate can be placed on a lazy susan and that will allow you to work on the cake in the same manner. Icing spatulas are used to spread the frosting on the cake. They are made of long narrow metal blades that are fairly flexible. 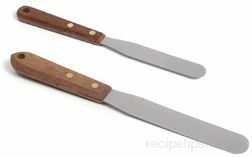 There are two types of spatulas. One is a straight blade and the other has an offset blade. The offset blade helps keep your knuckles out of the frosting while you are spreading over the cake. It also works well for spreading frosting on a cake in a pan. It allows you to get the spatula in all the corners and along the edges to spread the frosting evenly. These knives will help create a nice smooth frosted surface. They are available in sizes ranging from a small 4 inch blade to a long 10 inch blade. 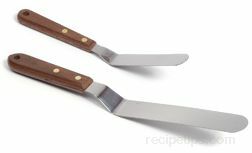 It is best to use a long bladed serrated knife it you need to trim the dome off the top of a cake or if you need to cut a cake in half to create a layered cake. The serrated edge of the blade enables it to slice cleanly through the cake without damaging its delicate textures. Be sure to use a serrated knife that has a blade that is longer than the diameter of the cake so that you are cutting across the whole width of the cake. A pastry brush is used to brush off the excess crumbs from the surface of the cake to help prevent them from getting into the frosting when it is spread on the cake. The pastry brush should have soft bristles so it does not damage the cake when brushing the crumbs off the cake. 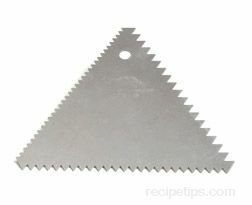 A decorating comb is a triangle-shaped tool that has a different design cut along each edge. It is made out of metal or plastic and used to create ridged and wavy lines in the frosting. The edge is pressed into the frosting and then drug across the frosting at a 90° angle to make a ridged pattern in the frosting or it can be drug across with a slight back and forth motion to create wavy lines. If using a lazy susan, you can press the comb into the frosting, hold it in place, and turn the cake to create the pattern rather than dragging the cake across the cake. A pastry bag is a cone shaped bag that has a small opening on one end and a large opening on the opposite end. The small opening is the decorating end that generally has different tips that can be interchanged to create different decorative shapes. 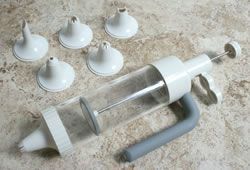 The large end is used for filling the bag with a mass of soft food, such as frosting, filling, whipped cream, or dough. The bag is squeezed to force the contents out the Decorating tip. The bags are made of different types of material, such as plastic, polyester, nylon, and plastic lined canvas or cotton. The decorating tips are dropped into the small end of the bag and held in place by the small hole that allows only the tip of the nozzle to exit the bag. The tips are often held in place by a coupler device. The frosting is pushed from the bag, going through the nozzle to apply it to the cake in a decorative pattern. Decorating tips are the nozzles on the end of a pastry bag that the frosting is forced through to apply it to the cake. There are many different sizes and designs available but unless you are going into the cake decorating business you will probably only usee a few of the common tips, which will still allow you to do a lot of creative decorating. Some of the common tips are the round tip for line work and writing, an open star tip for borders, a closed star for flower shapes, and the leaf tip for leaves and other border designs. Parchment cones are used for decorating with small amounts of frosting. They are used to apply lettering, small designs, and for touching up areas. 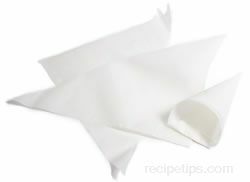 The triangle shaped parchment cones can be cut from sheets of parchment paper or they are available in several pre-cut sizes from stores that sell cake decorating supplies. The cones are hand constructed and then filled. Once filled, the tip is clipped, similar to disposable pastry bags. The cones are used in the same manner as the pastry bags except the couplings are not used so you are limited on the type of designs you can create. A decorating syringe works in a similar manner as the pastry bag and decorating tips. The syringe has frosting placed in the tube, which is then forced out the end where a decorating tip is attached. Different decorating tips are available that can be attached to the end of the syringe to produce different designs for decorating the cake. A flower nail is a tool used when creating piped flowers that will be placed on cake. The tool rotates easily in between your fingers as you are adding petals to the flower. There are tools available that make working with fondant a little easier. There are tools used for smoothing the fondant when it is placed on the cake and tools specially made for cutting the fondant. The cuttng tools are used to trim the excess fondant from the cake and also cutting tools for cutting patterns and designs for decorating. There are also rolling pins designed to work with the fondant. If you plan on working with fondant often, it may be to your benefit to purchase some of these tools. You may also want to look for someone who is experienced in working with fondant to help you get started working with this material. It is more difficult to work with and advise from someone with this experience would be beneficial.